I.S 325 part 2:1995 ‘Code of practice for use of masonry. Part 2 Masonry Construction’ gives advice on weather exposure and the entire Donegal/Inishowen peninsula is in a severe exposure zone with a high driving rain index. There is a guidance in respect of the required render specification being its type and suitability to the exposure conditions. Smooth render “woodfloat” is not recommended. B.S 5262 :1991 outlines similar recommended codes of practice for areas of severe exposure again smooth render “woodfloat” finish is not recommended. Both codes of practice pay close attention to the drying time of each layer and the significance of this in the prevention of cracking. Speedy onsite work now, and in the past does not allow for this drying time which inevitably will cause render cracking. The specified and recommended roughcast, buttercoat and tyrolean render type for severe exposure conditions are coarse by nature and this rough texture helps dissipate the rain water in various directions therefore not concentrating the water in one location. The woodfloat (smooth render) type dose not dissipate the rain water and this water can run down a wall and be drawn into cracks by capillary action. Thus the material behind the wall may become very wet and the trapped water cannot escape readily if the plaster is strong and impervious and can lead to frost damage if subjected to prolonged low temperatures as seen in the winter of 2010. Houses are better insulated in the last 20 years and less heat can easily escape past the insulation whichin turn will prevent the external block drying out. Previously houses were poorly insulated and heat loss through the cavity was high. This lost heat helped dry any masonry that was saturated on the external leaf. Now that leaf is constantly left saturated. Traditionally rough texture render was used in the past but from time to time woodfloat had been used which contained lime. Over the last 15 – 20 years woodfloat has become more common and with the introduction of plasticisers instead of the traditional lime, the self-healing “Autogenous Healing” properties of the lime was lost. Lime accommodates movement but plasticisers do not. Like lime, roughcast renders have been superseded by woodfloat renders with plasticisers which are neither suitable nor have crack reducing properties. Unfortunately, there is little to no standards to adhere to in relation to render but if one where to take note of the BS 5262:1991 the render choice for Donegal would change drastically. Please note the issue with crumbling blocks is mainly occurring in smooth rendered houses. A further good bit of reading was produced by Donegal County Council on this matter is Here. 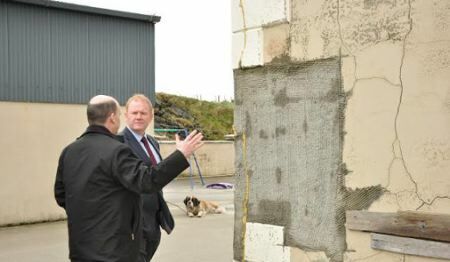 The media are focusing in on mica in the rock and how this has an effect on initial strength but they fail to mention the internal blocks of the house which from all tests carried out are sound. The purpose of mentioning this to you is that from inspections, I can conclude the workmanship on a lot of theses self build houses is awful and the need for strict building control is necessary, our neighbors twenty miles over the border have strict guidelines which are adhered too and I feel we need them too. This entry was posted in Building Regulations on September 8, 2016 by BRegs Admin. It is heartening to see someone with so thorough an understanding of the issues post on this matter. 1. Is there an issue with the walling type in the affected houses? Are they made of rendered hollow block and is this wall type permitted in Donegal – as opposed to rendered cavity wall with the outer leaf built of solid blocks or bricks? 2. Are there significant structural elements like ‘band beams’ at first floor and eaves level, which were traditionally used to ‘tie in’ block built dwelling? If so are they full width beams and heavily reinforced? 3. Although Mica is mentioned in the title, I don’t seem to see any issues raised where Mica might be contributing to the deterioration in the dwellings being reported. This is a very informative article. Weatherproofing of building walls is dealt with in Part C of the Building Regulations (C4 Resistance to weather and ground moisture: The floors, walls and roof of a building shall be do designed and constructed as to prevent the passage of moisture to the inside of the building or damage to the fabric of the building). Note that the regulation specifically deals with prevention of damage to the fabric of the building. Sections 3.2.2, 3.2.5, 3.2.6, 3.2.7, and 3.2.8 of the Technical Guildand Document (TGD) C deals with weatherproofing of walls. Nowhere does the TGD refer to requirements for external render, nor does the section on “Standards and other references” refer to IS325 Part 2 or BS5262. However, neglecting to specifically mention guidance on render doesn’t remove the necessity to ensure the render is appropriate and applied correctly. The regulation, as I’ve pointed out here before, is the statement of intent, not the guidance in the TGD and therefore a building doesn’t comply with Building Regulation C4 if the passage of moisture causes damage to the fabric of the building! This article is yet further evidence that self-regulation is no regulation! Building Control inspectors who are fully conversant with building construction, with a nationwide standard of interpretation of the Building Regulations (ie the statements of intent) are the only answer to provide consumers with real comfort. As in the legal profession where case law determines interpretation of statutory laws and acts, a fully functioning state run independent Building Control system would allow for a coherent interpretation of the Regulations, and probably ensure appropriate updating, revising, and amending of the Technical Guidance Documents to boot! How much evidence is needed to prove that the system we have is not working and will not work. Terrific analysis Seamus and thanks for the info. While not specifically referring to the problems in Donegal, this specific issue of exposure was highlighted in a presentation on B. Regs and BCAR in EI last Monday night. This is the URL of a very interesting document by Joseph Little Architect. As you can see from the URL this is from a folder that seems to go back to August 2010 so read with the caution that the industry in general and Joe’s thoughts in particular have most likely moved on from the comments in this document. Yes it is exactly this sort of “finer point” or issue that needs a national building control and some sort of national authority setting the standards of construction. Given the above would for example deliberately ventilating the cavity allow the safe use of a smooth render? (I am an architect after all!) The issue of increased insulation and the effects on building fabric (especially the wet/cold side) does need some consideration. The RIAI highlighted a nightmare example a while back where internal insulation of a single leaf brick wall lead led to a lack of drying to the brick and consequent freeze thaw of water within the brick leading to disintegration. When considering external walling in Ireland a good thing is that the temperature seldom drops to minus 20 or goes above 35. Most of the time it wanders between minus 2 and plus 22. So there is a limited range of temperature. But the moisture readings span the scale, from 0% to 100% relative humidity. Water has to be dealt with externally as an airborne deluge, as a ground covering flood and as an underground movement. Internally it must be dealt with as an interstitial source of reduced thermal insulation, an essential for fungal growth and a cause of materials decay. External walls are where all these forces must be successfully resolved, in addition their role in carrying the structural load and helping to contain the spread of fire. A case can be made for external insulation and empirical studies appear to support this position – at least as far as reduction of cold bridges and preservation of the structure goes. This begs the question of what should the external weathering surface be and how should the insulation behind it be protected from wind action and thermal looping in the cavity. This leads us to consider the best way of reducing vapour penetration from inside the building into the structure and thence the insulation and prevention of build up of moisture to avoid rot, mould, reduced thermal performance and degradation of materials. Into all of this comes fire resistance. Penetrations through the walls. Escape from upper floors. No one has done a fire test on an house with 300 mm of external plastic insulation. Such a house might have maybe 25 mm of render and awkward details at opes. Will these details be done any better than the top of the party walls in that six house terrace that burned through in one hour? What happens if the weathering material is not plaster but metal that readily conducts heat? Will the whole house go up? This is why at Plan Expo 2009 I asked the assembled intelligentsia to request the Government to commission a set of deemed-to-comply drawings for a 3-Bed Semi – to show how all the regulations could be complied with at the same time so as to give give proper technical guidance to all. Will it take the deaths of a family in a roman candle house to get the Department of the Environment off its collective backsides and advise us as opposed to merely setting every more stringent standards to appease the Global Warming Carbonistas?